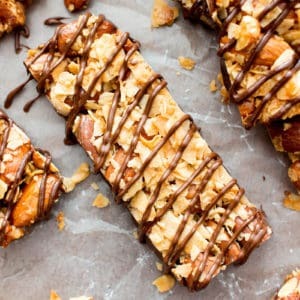 5 Ingredient Dark Chocolate Almond & Coconut Homemade KIND Bars (V, GF): an easy recipe for homemade KIND bars coated in a rich layer of chocolate. Paleo, Vegan, Gluten-Free, Dairy-Free. When in doubt, dip it in chocolate. Basically, my mantra for being. For baking, for… just about everything. But can you believe the things people dip in chocolate?? Cookies, gummy bears, shoes, bars, shirt-sleeves… Okay, fine, the shirt-sleeves are just totally me. I admit it. And that may not have been terribly purposeful. If at all. The thing is, dipping almost anything in chocolate makes it taste amazing. Have you seen that video from Rhett & Link? I’m gonna go ahead and pretend I know them personally… but obviously, I’m just a big fan of Good Mythical Morning. They’re so soothing, sweet, funny, all of it. And best of all, they make all of these crazy food videos. And by food videos, I mean videos with food that us normal folk would never, ever eat. Think: totally inedible items. In one video, they dip all kinds of crazy stuff in chocolate. In another video, they dip everything in cake batter, and on and on. Anyway, in the chocolate dipping video, they conclude that EVERYTHING tastes better dipped in chocolate. Hence, when in doubt, dip it in chocolate. That’s my long-winded explanation (pfft, as if dark chocolate dipped anything needs an explanation) for these 5 Ingredient Dark Chocolate Almond & Coconut Homemade KIND Bars. 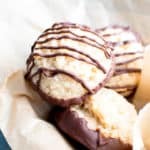 A few weeks ago, I shared my sister-requested 3 Ingredient Homemade KIND Coconut Almond Bar Recipe. According to my sister Penny, these are THE best KIND bar flavor, ever. 🙂 I’m in love with their simplicity, and frankly surprised myself at how few ingredients it took to make the homemade version. So… drumroll please… may I present to you the chocolate-dipped version: 5 Ingredient Dark Chocolate Almond & Coconut Homemade KIND Bars. Yeah, I pretty sure Rhett and Link just said, “Let’s talk about that.” And then, proceeded to eat all of the homemade KIND bars like they were bags of chips. Yes, I also noticed their affinity for chips. And now I want chips, too. 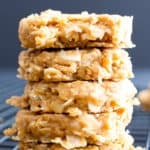 But I will happily eat these deliciously toasted coconut chips-infused homemade KIND bars! See what I did there? 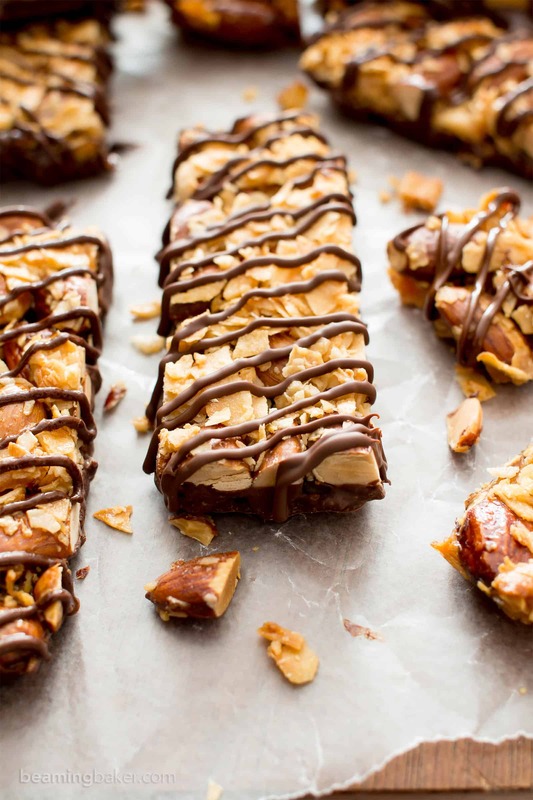 And… these No Bake Paleo Chocolate Pecan Bars, just for fun. Totally dessert and snack-worthy! 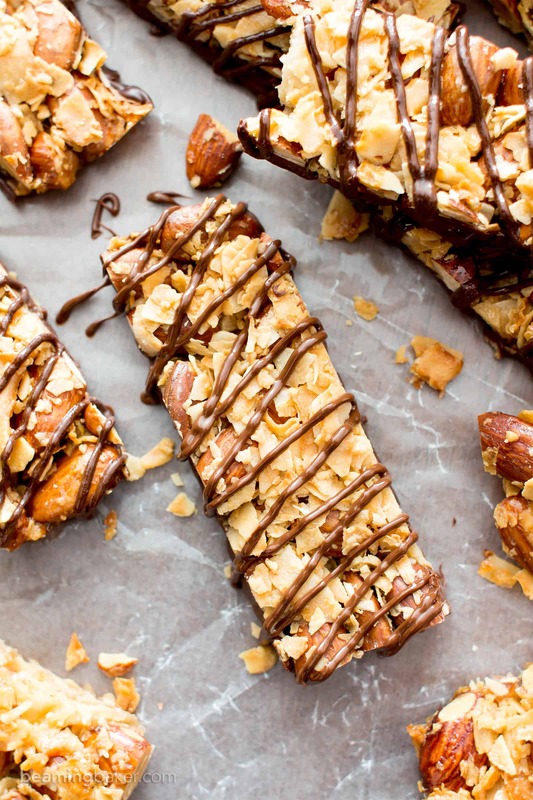 the almond coconut KIND bar of your dreams! What’s your favorite item to dip in chocolate? 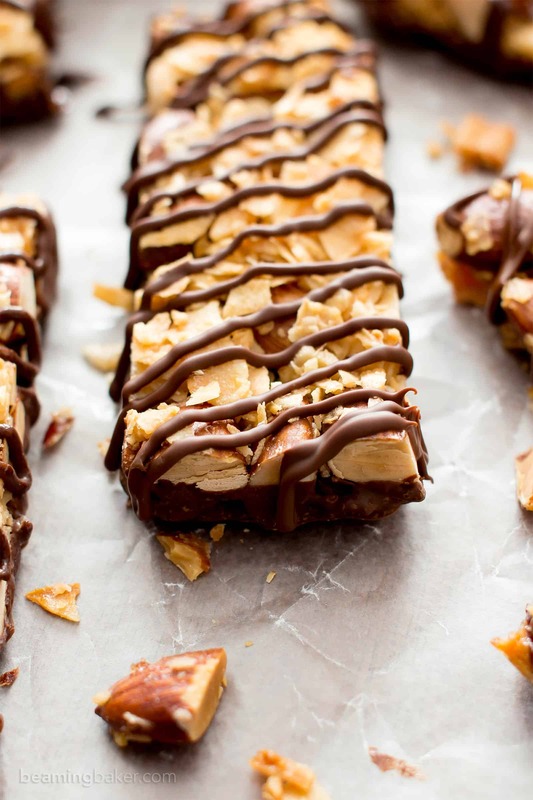 And these no bake paleo chocolate almond butter bars. You’ve got to try these! They’re made with just 4 ingredients and so deliciously satisfying! Preheat oven to 325°F. Line an 8-inch square baking pan with parchment paper. Set aside. 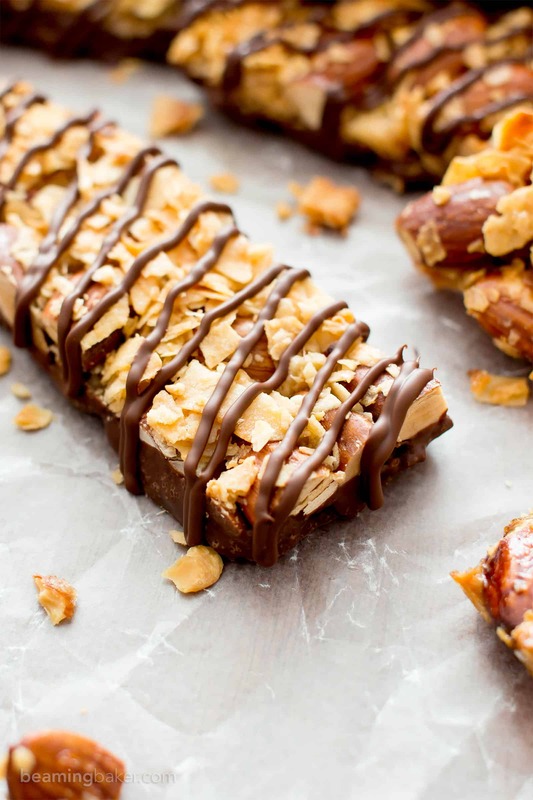 Make the bars: Add almonds, coconut and salt (if using) to a large bowl. Stir until well mixed. Pour maple syrup over this mixture. Fold until well incorporated and fully coated. Pour this mixture into the prepared baking pan. Using a rubber spatula, smooth into an even, very tightly-packed layer. Bake for 30-40 minutes (mine took 35 mins). 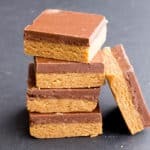 Bars must bake thoroughly, or they won’t hold together when cooled. Allow to cool in the baking pan for 1 hour, or until completely cooled. Pinching opposite ends of the parchment paper lining, lift bars out of pan. Gently peel paper off the bottom of the bars. Slice into 12 bars (6 rows by 2 columns). Line a large baking sheet with parchment paper or wax paper. Clear some room in the freezer for this sheet--you will need it later. Set the sheet on a clear work area. 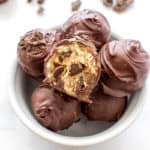 Dip the bars: Melt the chocolate using the double boiler method, or doing the following. Add Chocolate Coating ingredients to a medium microwave-safe bowl (large enough to dip bars in). Heat in the microwave in 15-second increments until softened and melted. Stir in between heating, until smooth. Dip the bottom of one bar into the melted chocolate, scraping off excess on the side of the bowl. There should be enough chocolate for a thin layer on each bar. Place on the prepared baking sheet. Repeat, spacing each bar evenly apart, until all bars are dipped. Drizzle the bars: Add Chocolate Drizzle ingredients to a clean, small microwave-safe bowl. Repeat heating instructions, until chocolate is smooth. Spoon melted chocolate into a zip bag with a tiny corner snipped off. 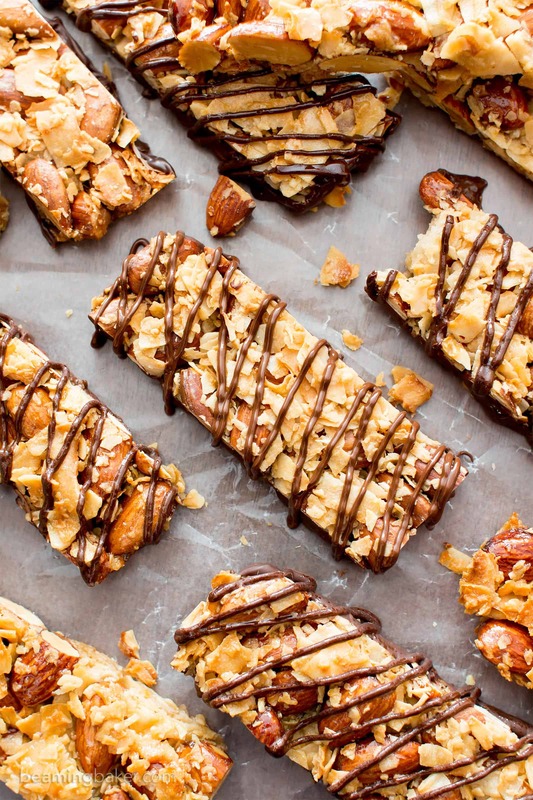 Drizzle each bar in a zigzag pattern. Place bars carefully into the freezer. Freeze for 10-20 minutes, or until chocolate is completely hardened. Enjoy! Storing instructions below. - Adapted from my 3 Ingredient Homemade KIND Coconut Almond Bars and my Dark Chocolate Sea Salt KIND Nut Bars. - Store in an airtight container at room temperature for up 1 month. 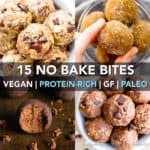 - More Easy Paleo Snacks: no bake almond butter brownie bites, oil-free cinnamon paleo granola, no bake chocolate almond butter bars. Oh WOW these bars look so delicious! I love how easy it is to make them and the fact that it fits so many diet regimes. Definitely going to try this recipe soon! Your photos are gorgeous as always! I love chocolate and coconut, and love how this bar has is so easy to make and sounds absolutely delicious ???? Aw, thanks so much, Trang. 🙂 These bars have your name all over them! WOW how delicious do these look. Homemade is always best…and these are better than bought hands down. would it work to sub in oats for 1/2 the coconut? I’m crazy for kind bars so I’ve GOT to try these! We have these bars around my house for snacking. My kids love them! I can’t wait to try the homemade version! This is such a great treat that I know all my boys will love! Perfect for an after school snack I don’t have to feel guilty about giving them. 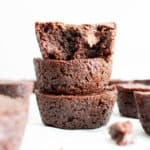 Chocolate….super easy to make….chocolate…..homemade….I said chocolate, right?!? I’ll take them all! Haha. That just about sums it up! Enjoy! Those look like absolute perfection, awesome job! 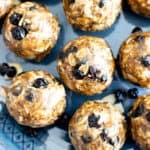 These are packed with the most amazing ingredients! A definite must try! So many of my faves! Hope you get to try! 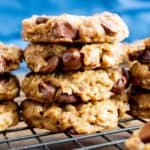 I so need a new snack recipe! Maybe this will my nxt one! Now these are my kind of KIND bars 😉 Dipped in chocolate! These bars look so full of flavour! 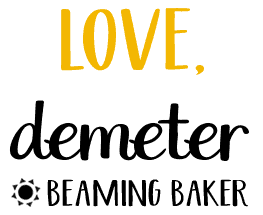 Hope you’re having an awesome week, Demeter! Oh yeah!! Chocolate makes everything better! 😉 Same to you, Marsha! I made these today and they are so tasty! It made my whole house smell good, too! Can you please post the nutritional information? Thanks! 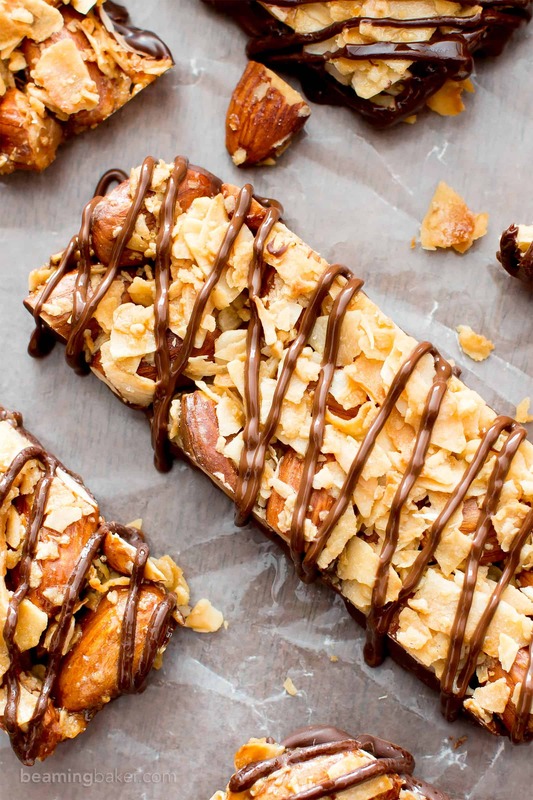 These KIND bars look absolutely perfect — even better than regular KIND bars – Wow! and yes, when in doubt, dip it in chocolate! I think these would also be delicious with lightly salted and roasted almonds minus the salt in the recipe. They were yummy! Although they did not cut well into bars but I just put chocolate on the pieces and still delicious. These are awesome. I sub half the almonds with pecans, and use raw nuts? As u find they toast enough in baking. I also just drizzle, I don’t dip. I eat these for breakfast so they’re perfect for me with just a hint of chocolate. I love having thos protein rich, almost sinless snack on hand to fend off the “hangry” attacks! 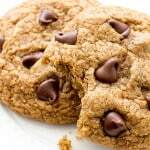 I am having a hard time finding paleo chocolates chips – can you suggest a brand that I can buy online? Thanks! The taste is really good but they crumbled to a gronola like texture! I’m so sad!!! Hi Vivian! Make sure you pack the ingredients into the pan tightly, and that you leave the bars in the pan to cool completely. The extra heat helps them firm up before cutting. Hope his helps!